Where do you spend a cold, wet day in northern Spain? How about in a cold wet cave? We got tickets to see the Museum at the Caves of Alta Mira and had planned to spend the rest of the afternoon strolling around Santilla, billed as “the most charming village in Spain.” However, no village is charming, or even quaint, on a blustery day with fifty degree temperatures, and we were fascinated by the museum’ artifacts and stories about paleolithic life and how the cave of Alta Mira with its marvelous ceiling paintings was discovered in the late 19th century. 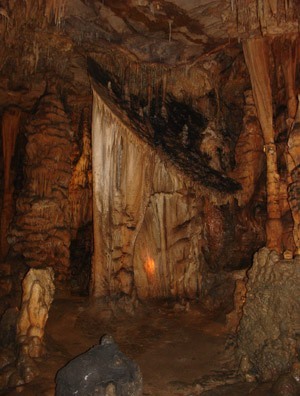 The museum includes a digitally recreated exact replica of the main room of the original caves, which are currently closed to all but researchers. The digital recreation claims to give you the experience of being in the cave (same dimensions, same temperature, same images on the ceiling, same crick in the neck) but THIS IS NOT SO. We wanted to explore more, and found out that there are other caves in the area which are still viewable in the original, so off we went to las cuevas del Castilla and nearby Las Monedas. Believe me – the real thing is logarithmically greater than the digital imitation. First, we drove along a twisty one-lane road to the unlikely Visitor’s Center perched on the side of a hill overlooking the mist-filled valley far below. Then we waited, huddled under one umbrella, for the guide to return from her lunch and unlock the Visitor’s Center. We looked over the few postcards and tchotchkes while the guide located the keys to the Cave . Then W and I and a handful of other soggy visitors followed the guide to the first Cave, El Castillo. Wow! the geological formations in the limestone caverns are well worth the twisty drive up the mountain road and the price of admission. We felt something of the wonder and mystery that the first paleolithic explorer must have felt when he discovered these marvels by torchlight and decided that they must be sacred and secret. 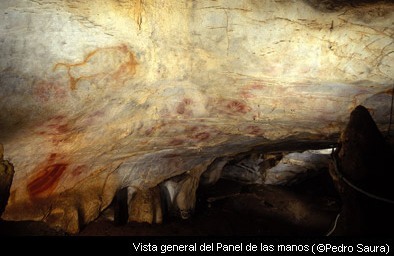 Among the limestone cascades and columns the guide pointed out paleolithic drawings of bison, horses, goats, and dee. In one spot an upper wall and cieling were covered with dozens of negative-imprints of hands made by blowing ochre powder through a tube. Was this some sort of early graffiti, or a sign of a rite of passage accomplished? 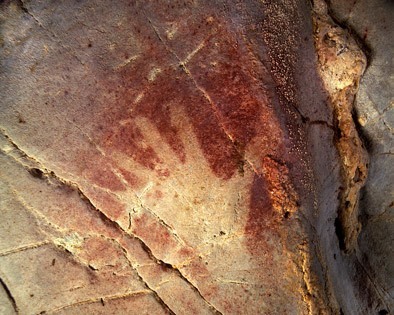 Some of the hands were large, others small and child-like, and all were of the right hand. What did this mean, once upon a time? 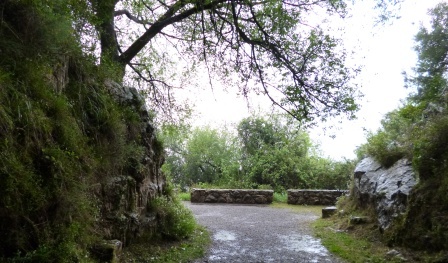 The other visitors, deterred by the increasing rain, decamped, but W and I decided to visit a second cave further down the gravel road, Las Monedas. We had to wait in a cleft in the rock while the guide closed up the first cave and saw the other visitors off. It was marvelously quiet. The only sounds were the drips of rain onto the hood of my windbreaker. The mist was so thick that we could not see the valley below at all. Finally the guide appeared, unbarring the second opening. Then she led us among marvelous columns and curtains of frozen flowing limestone, spangled with calcite crystals and painted in gold, red, and blue from mineral deposits. We saw a well which once held the skeleton of a trapped cave bear, and a deep crevice in which had been found mysterious coins from the 15th century, indicating that someone had discovered the cave centuries before it became known in the 19th century, and apparently escaped alive though slightly poorer. When someone tells you that a movie or a photo exhibit or a museum diorama is “just like being there” – DON’T BELIEVE THEM! GO AND SEE!